Everyone loves stickers, but there is probably nowhere it fits more than inside the classroom. From fun rewards for students to useful organizational tools, school sticker printing is a must for every school administrator and teacher. Print your school sticker designs here at PrintPlace. We have a wide range of printing options that are sure to highlight your school identity. Would you like fun and quirky stickers, or formal labels for school materials? Choose from our selection of paper stocks and coatings to make your school spirit stick. 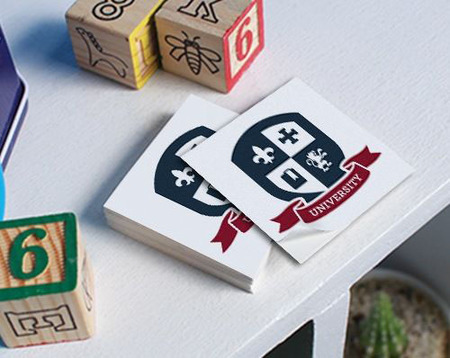 Our school sticker printing is available in several sizes, including the popular size 2” x 2”. You can print a minimum of 25 stickers up to 100,000. Your school stickers can be ready for shipping as soon as 1 business day. For additional custom options, call our print experts or fill out our custom order form. Our school sticker layout templates will ensure your artwork meets requirements for printing. Our templates include guidelines so that your artwork would print out properly. Our school stickers are available in several shapes—rectangle, square, circle, and oval. Here are a few applications that you can do to take advantage of our school sticker printing options. Circle School Stickers - Circular school stickers are great for school logos. Most logos are circular, which make the design stand out with the shape. Rectangle School Stickers - These school stickers are perfect labels for school supplies. The shape allows you to put the pertinent information needed. Oval School Stickers - Like rectangle school stickers, you can put a lot of information on oval stickers. You can even use them as name tags for back to school events. Square School Stickers - Want to reward students for a job well done? Square school stickers are the perfect teacher rewards for young students. Call our friendly print experts with any questions or to print school stickers now.